The conference was also really great and I was able to reconnect with old friends/colleagues and meet lots of new people and hear about all sorts of interesting projects and ideas that were floating around. This conference was especially great due to the great diversity of researchers, both in terms of intersecting and complementary fields of study but also in terms of backgrounds and countries and educational contexts. I think they said the conference had about 400 attendees from 38 different countries! Pretty cool. 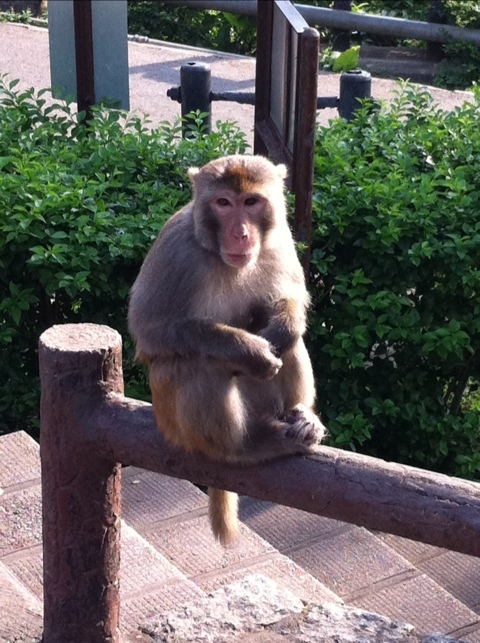 Author cynthiadangeloPosted on July 8, 2011 July 17, 2011 Categories travelTags MonkeysLeave a comment on Monkeys! Tuesday morning started out pretty good. Elizabeth and I went in search of a bakery a couple of blocks from our hotel, and thanks to Google maps and my sense of direction we were able to find it really easily. We each got an assortment of undescribed buns and then Elizabeth headed to the University for her workshop and I went back to the hotel to do some work. For lunch I braved the extreme heat and humidity to do some exploring. I took the ding ding (awesome double decker trams) to the MTR station (awesome subway) over to Causeway Bay, on the eastern side of Hong Kong Island. I was on the search for Mak’s Noodle which I heard was really good. It took me forever to find it even though I knew where it was supposed to be; this was due mostly to the almost ridiculous amount of Chinese signs, people, restaurants, shops, and people in this very concentrated area. Hong Kong is one of the most densely populated areas (it might actually be the most) in the world and I totally believe it. Well, I finally found the noodle place and ordered some shrimp dumpling noodle soup, which arrived quickly. It was extremely delicious. My only complaint was that it was a pretty small bowl and I could’ve easily eaten twice that much. After lunch I headed over to the nearby Victoria Park, which is a large public park. The park had free wifi which was pretty awesome, but it was extremely humid and I was starting to melt. There were some nice gardens, tennis courts, and a jogging track (that many people were actually running on!) but I was needing to find air conditioning and didn’t stay too long. English, and Chinese (instead of just Swedish and English) and that it was a lot smaller than a usual IKEA. I got my ice cream cone and happily headed back to the hotel. Tuesday evening I went back up to the University for the public forum that was starting the conference off which was pretty interesting (it included both learning scientists and policy makers from all over the world). There was a short reception after this which ran out of food and booze waaaay too quickly (this has continued to be true throughout the conference). For dinner, about 30 of us headed to a vegetarian restaurant in the mid-levels area called Pure Veggie House. We had an 11 course meal served family style. Almost all of the courses were really delicious. I had probably 10 different kinds of mushrooms in all sorts of combinations, as well as some soups and curries and other yummy things. After dinner, we headed over to a bar area that we heard was pretty cool and it was very different than other areas of Hong Kong. Someone in our group said it reminded them of Bourbon St. There were a bunch of bars all lined up next to each other and people walking around with beers. There were also a group of roaming monks (at least they were pretending to be monks) trying to sell beads and a bunch of other people selling light up headbands and glasses. After one (relatively) expensive beer (a Guinness, which tasted kind of off), I headed back to the hotel to get some sleep. It took me a while to find Mak’s Noodle in Causeway Bay, but find it I did and I got some awesome noodles as a prize for my diligent searching. 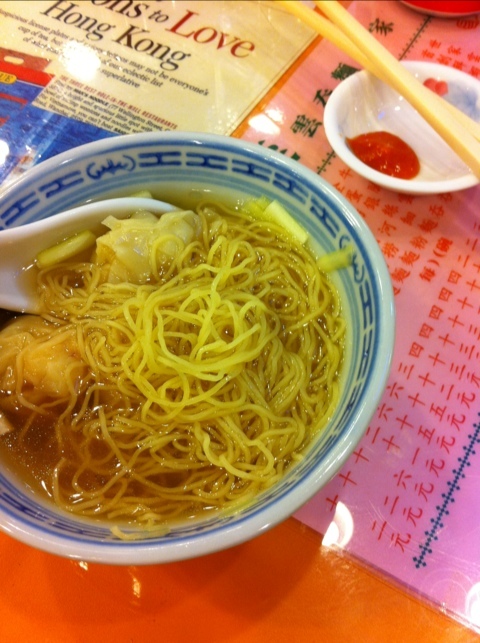 Author cynthiadangeloPosted on July 5, 2011 Categories travelTags food, travel1 Comment on Noodles! one of the main streets at night. there are taxis, buses, and trams everywhere. some kind of juice (or maybe soy milk?) that I’ve seen around. there is a vending machine on HKU campus that has these and gives you a random one. I arrived in Hong Kong late on Saturday (which, since I left Madison on Friday morning, felt really strange). It was a very long flight (about 15 hours), but wasn’t too terrible overall. There was a really good selection of movies on our personal seat-back TVs and I was sitting with Elizabeth (who I was traveling with from Madison) and luckily another CSCL conference-goer who was very nice and knew a lot of the same people that I did and all three of us had lots to talk about. We took a cab in from the airport (which is on one of the outlying islands) and driving in we were amazed at the huge harbor and the density of the skyscrapers and shipping containers and buses and people. We almost immediately went to sleep and although I woke up a couple times during the night, I woke up feeling really rested and energized. The major drawback here is the extreme humidity. It is oppressive. The forecast for the entire week is basically 90 and really humid, with a chance of thunderstorms on some days (it hasn’t rained yet, though). I’m not sure that I have ever sweated this much. Sunday a big group of us (me, Elizabeth, Ben, Marcela, Vanessa, and Garrett) did some exploring. They let me lead them around the city and I think we did a good job of a) not really getting lost and b) doing a lot of sightseeing and activities. The first thing we did was take one of the old rickety double decker trams over to the Central area of HK Island and then walked through Hong Kong Park on our way to the peak tram up to Victoria Peak. 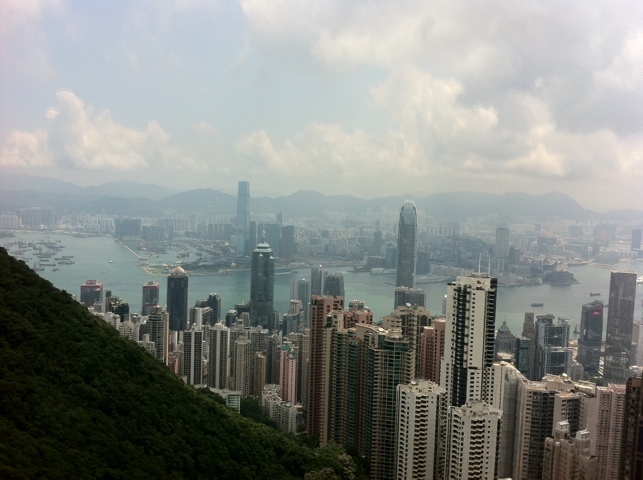 This is the highest point in HK and has an amazing view of the place. After we took lots of pictures, we found a place to have lunch. I got some Indonesian style fried rice which was super delicious. Other people got curry or noodles or things like that, as well some interesting pear or tangerine tea drinks. Then we headed back down the tram and walked over to the MTR (the awesome subway) to go to the Sheung Wan area to see the Man Mo Temple which had some really neat conical incense everywhere. There were also lots of old shops with interesting things for sale (the temple is on the oldest street in HK). We then headed over to the Western Market which had a couple shops, a whole floor of fabric, and a wedding reception about to happen on the third floor. After this our group split up a bit, and Elizabeth, Vanessa, and I took the MTR up to Kowloon to go to the night market and the ladies’ market. These were composed of stall after stall selling all sorts of things, mostly fake designer handbags, toys, scarves, remote controlled helicopters, clothes, bowls, paintings, and more fake designer handbags. 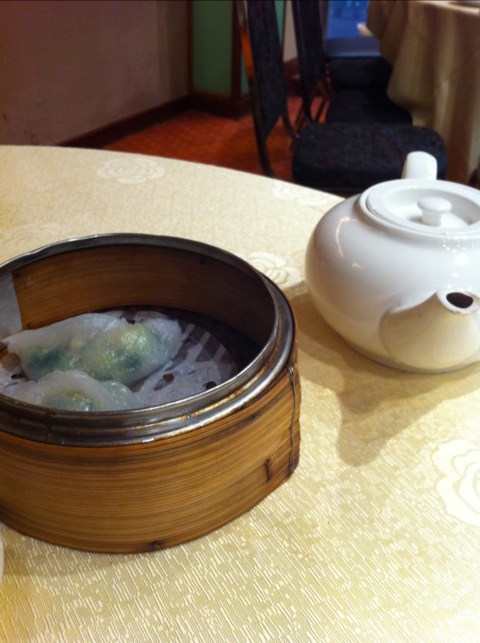 After that we stopped at a vegetarian place and got some dim sum which was pretty tasty. Then Elizabeth and I headed back to the hotel to crash. Today I am hanging out at the University’s library, getting some work done and preparing my talk for Wednesday. Looking forward for the conference to actually start! 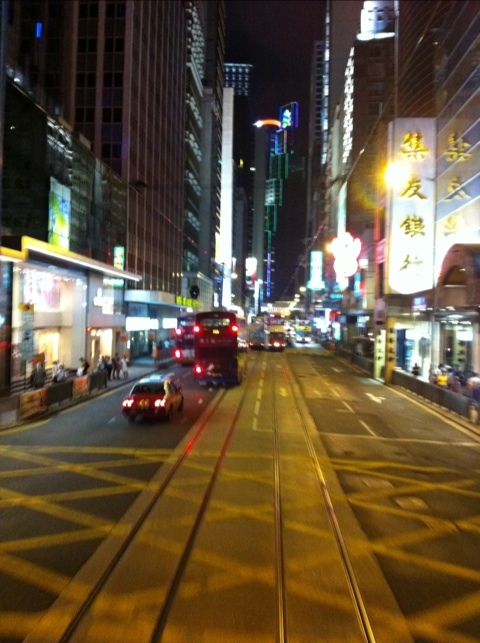 Author cynthiadangeloPosted on July 3, 2011 July 3, 2011 Categories travelTags Hong Kong, travelLeave a comment on Hong Kong!